I was working on one of these old iDRACs and once I added a new ISO, I was not able to mount it because of the error below. iDRAC 6: Drive Error Either Virtual Media is detached or Virtual Media redirection for the selected virtual disk drive is already in use. In order to fix this issue, connect to iDRAC with an admin account and go to System > Console/Media, then on Configuration. 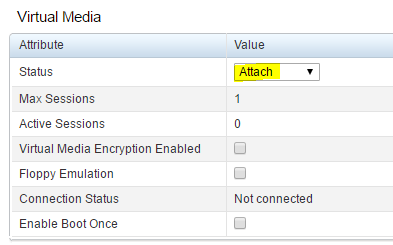 Under “Virtual Media” change it to Attach (or Auto Attach if you like). Apply the changes and you’re good to go! 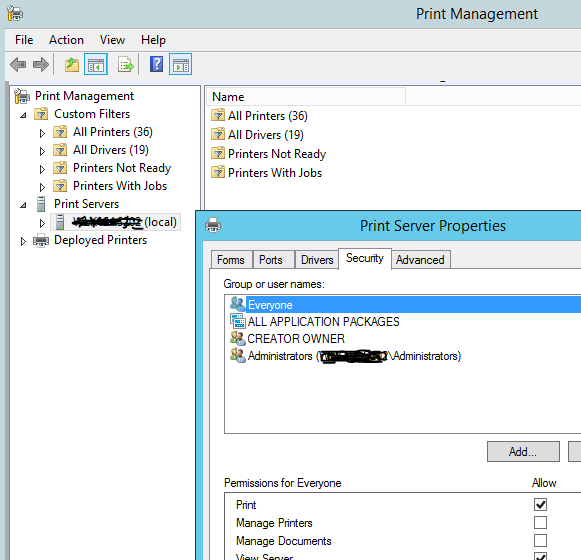 My idea is to get a security group to be able to fully manage the print server, without being Server Admins. And I want to achieve this before adding any printer so that permissions will eventually get applied on new printers. In theory this step will help me with automating a print server installation/configuration. I was losing any hope until I came across a technet forum’s thread where there was a discussion over “setprinter.exe“, a tool contained in the Windows Server 2003 Resource Kit. However the one that comes with it, doesn’t really work. After some more time, I was able to obtain the updated MS version of the tool which you can download from here: SetPrinter.Zip. Note that I only have the 64bit version of it, so this won’t work on a 32bit system. I will try and explain how we’re going to use this application before showing you a basic powershell script that will assign the permissions. The cool thing of this tool is that it can work remotely as well. First of all, we will work with the pSecurityDescriptor. This contains the access type and depending on how we use setprinter.exe, we can grab and/or set the pSecurityDescriptor for the Print Server itself or for one of its printers; the last option would be useless as Powershell nowadays allows you to change printer’s security settings easily. Note that right after the print server you need to add a backslash and you need a space and the number 3 right after. This might seem confusing, but ultimately it’s simple: Anything within ( ) contains the permissions and the user/group identification and for the group I just added, that’s its SID! When I was testing this, I ended up adding an extra group manually (again, Full permissions) and re-ran the setprinter.exe command so that I could compare the 3 outputs and have a better understanding of what was happening. $NewSecurity = $CurrentSecurity.Replace(" ","").Replace("pSecurityDescriptor=","").Replace('"','') + "(A;CIIO;LCSWSDRCWDWO;;;$($SID))(A;OIIO;RPWPSDRCWDWO;;;$($SID))(A;;CCDCSDRCWDWO;;;$($SID))"
I’ve added a lot of comments to make sure everything is explained. Remember that the AD Powershell module is required for getting the SID (you could use psgetsid if you don’t want to use the AD Module) and also that you can run this remotely from your own machine as setprinter.exe will be able to grab/apply permissions remotely.